BOSTON, MA--(Marketwired - Dec 10, 2013) - Renaissance Boston Waterfront invites guests to detox, unwind, and discover this winter with two new packages ideal for a quick escape to one of New England's most vibrant and historic cities. Perfect for families and couples alike, the Tea Time on the Boston Waterfront experience celebrates the 240th anniversary of one of America's most noteworthy historical events, the Boston Tea Party. Guests will be transported back to Pre-Revolutionary America with interactive and hands-on family-friendly exhibits and reenactments at the floating Boston Tea Party Ships(SM) & Museum, located on the Congress Street Bridge in Boston's Fort Point Channel over the actual body of water where the Boston Tea Party took place on December 16, 1773. Back at this upscale hotel are spiked tea cocktails for the parents. The Tea Time on the Boston Waterfront package is available Thursday - Sunday from November 29, 2013 until February 28, 2014. Rates start at $244 per night. Reservations can be made here by entering promotional code ARN or by calling 1-800-HOTELS1 and asking for the Tea Time on the Boston Waterfront package. Package does not include tax, parking or gratuities. This promotion is not valid for groups of 10 or more. Blackout dates may apply. Ten-day advance reservation required. Renaissance Boston Waterfront has a remedy for the post-holiday blues -- the New Year, New You package available this January. Guests are invited to start the new year off right with the perfect mix of detoxification and relaxation. Upon arrival, travelers will enjoy an invigorating red juice and will have access to the state-of-the-art health club -- including a lap pool and sauna -- throughout the entire stay. The morning after, guests can refuel with a morning pick-me-up smoothie and enjoy everything that the Boston Waterfront has to offer. The New Year, New You package is available Thursday - Sunday from January 1, 2014 until February 28, 2014. Rates start at $199 per night. Reservations can be made here by entering promotional code ZJL or by calling 1-800-HOTELS1 and asking for the New Year, New You package. Package does not include tax, parking or gratuities. This promotion is not valid for groups of 10 or more. Blackout dates may apply. Ten-day advance reservation required. The Renaissance Boston Waterfront Hotel features 471 guestrooms and 21 suites, a sleek, marine-inspired interior design, as well as full health club facilities with a sparkling indoor lap pool. The hotel is near many major attractions including the Boston World Trade Center, New England Aquarium, Faneuil Hall, Institute of Contemporary Art, and more. 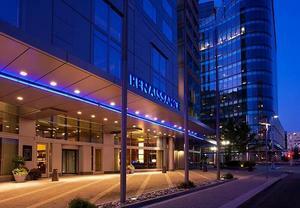 This Boston hotel is also conveniently located near Logan Airport and downtown Boston. For hotel information, visit http://www.marriott.com/hotels/travel/boswf-renaissance-boston-waterfront-hotel/ or call 617.338.4111. Follow us on www.facebook.com/RenaissanceBoston, or @CapizLoungeRen on Twitter https://mobile.twitter.com/CapizLoungeRen. Renaissance Hotels encourages guests to Live Life to Discover(SM) at more than 155 hotels in 35 countries around the world. Each hotel is unique and every stay offers an opportunity to explore local discoveries exclusive to the destination. At every hotel, Renaissance Navigators are local experts ready to assist guests in discovering local flavors and activities. Signature RLife LIVE entertainment events are designed to showcase emerging talent in music, the arts, culinary and more to inspire discovery. R.E.N. Meetings offers groups an experience beyond a traditional meeting rooted in creative sensory meeting design, RLife LIVE networking events and custom curated local Navigator excursions. At Renaissance Hotels, we work to ensure that every trip is transformed into an eye-opening, unforgettable journey. You spend your life working, you should discover the world as you go. To discover more visit www.renhotels.com. Renaissance Boston Waterfront hotel invites guests to discover this winter with two new packages ideal for a quick escape to one of New England's most vibrant and historic cities. Perfect for families and couples alike, the Tea Time on the Boston Waterfront experience celebrates the Boston Tea Party. While the remedy for the post-holiday blues -- the New Year, New You package this January.